A descendent of the Bloodhound and Black and Tan Foxhound, this pup was bred to hunt raccoon and other small game. With a strong ability to deal with excessive heat and cold, he has since moved on to bigger game, including the mountain lion. An adaptable pet perfect for working and hunting, he is a loyal and passionate worker. The Black and Tan Coonhound is a true hound breed in every sense of its name. Not only does it look the part, but it’s got a nose on it that will track down whatever it is hunting – but the Black and Tan Coonhound really loves going after raccoons and opossums. Known to bay and howl until the hunter arrives, this dog is mellow, calm, determined and hardworking. 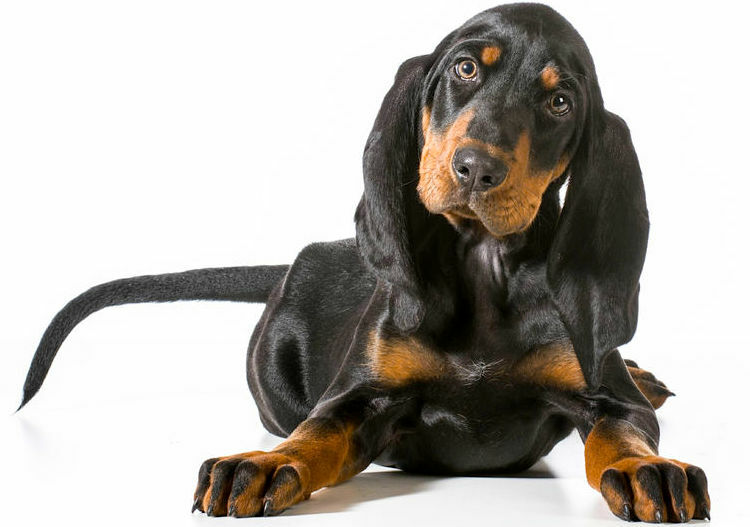 A great pet for families and lovers of the outdoors, the Black and Tan Coonhound may be the perfect fit for your household. Easily distracted by various scents. Once he has decided to follow one you'll have a very hard time calling him off — this dog needs to be leashed! Coonhounds are not homebodies and will roam if given the chance. They can go for miles before looking up and realizing that home is nowhere to be found. Makes a good jogging or running companion but is also more than satisfied with 30 to 60 minutes of daily exercise, and walks that allow for plenty of sniffing time. This breed does well with children, but is active and bouncy when young. Easily gains weight if given the chance. Can be stubborn and independent, making training a challenge. A bored Coonhound is a noisy, destructive Coonhound. He needs lots human companionship and training. Obedience training is highly recommended and likely to lead to a closer relationship with your dog. 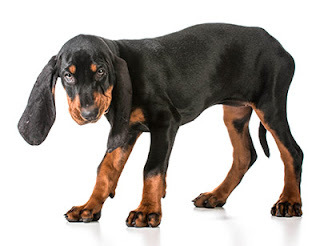 Never buy a Black and Tan Coonhound from a puppy broker or pet store. Reputable breeders do not sell to middlemen or retailers, and there are no guarantees as to whether the puppy had healthy parents. Interview breeders thoroughly, and make sure the puppy's parents have been screened for genetic diseases pertinent to that breed. Ask breeders about the health issues they've encountered in their dogs, and don't believe anyone who claims that her dogs never have any health problems. Ask for references so you can contact other puppy buyers to see if they're happy with their Coonhound. Doing your homework may save you a lot of heartbreak later. The Black and Tan was the first Coonhound breed admitted to AKC registration. The Black and Tan is known as a “trail and tree hound,” meaning he can not only find his quarry but also tree it. This breed has a black coat with tan points above the eyes, on the sides of the muzzle, and on the chest, legs and breeching (the upper thigh area), plus black pencil markings on the toes. Scenthounds descend from the Talbot Hound, the hunting dog used by nobles and kings a thousand years ago. The direct ancestor of the Black and Tan Coonhound is the English Foxhound, but the coonhound breeds themselves are a uniquely American creation. The Black and Tan Coonhound, developed in the mountains of the southern United States in the 1700s, takes his size, coloring, long ears, and scenting ability from the foxhounds and bloodhounds perched in the branches of his family tree. He was bred to tree raccoons and possums, but he's more than capable of running bigger game. That versatility made him an ideal companion for colonial settlers who created him to be a "trail and tree" dog, meaning he could find his quarry and tree it until the hunter arrived. The American Kennel Club recognized the breed in 1945. 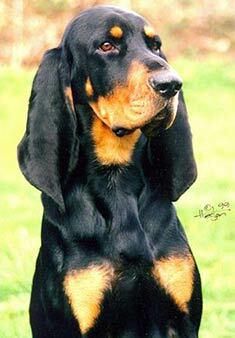 The first Black and Tan Coonhound registered by the AKC was Grand Mere Big Rock Molly. Despite his fine qualities, the Coonhound has never made the leap to popular companion dog, something for which his fans are probably grateful. He ranks 131st among the 155 breeds and varieties recognized by the AKC. 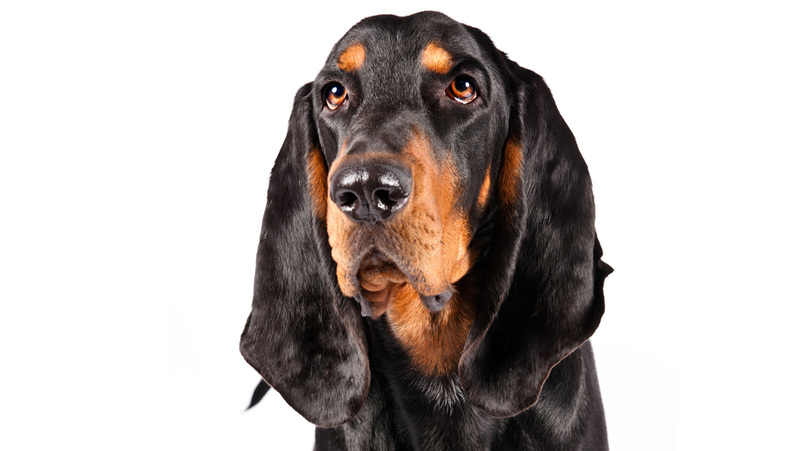 Black and Tan Coonhounds are a pleasant, laid-back addition to families of all sizes and ages. Playful as puppies, this breed mellows out considerably in adulthood and is happy with moderate exercise and lots of time to relax around the house. Black and Tans are good with children, they are patient and not dominant, but they aren't particularly playful when the get older. Many Black and Tan Coonhounds think they are lapdogs, despite their size, and can ball up into the tiniest of spaces to sleep next to the people they love. The Black and Tan Coonhound, which has an average lifespan of 10 to 12 years, is prone to minor health concerns such as ectropion and hypothyroidism, and major issues like canine hip dysplasia (CHD). The Coonhound also occasionally suffers from Hemophilia B. To identify some of these issues, a veterinarian may recommend hip and thyroid tests for the dog. Grooming a Black and Tan Coonhound consists of the occasional brushing of the coat and regular ear checkups. Exercise, meanwhile, may be satisfied with a long walk, short jog, or an excursion on a field. 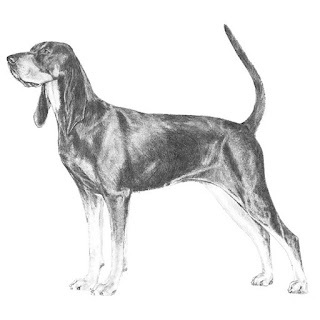 The Coonhound also loves to run a few miles and wanders on catching a scent. As the Black and Tan drools, it is a good idea to wipe its face regularly. The Black and Tan Coonhound is not recommended for apartment life. They are relatively inactive indoors and will do best with at least a large yard. Black and Tans assume they are the leader and require their trainer to prove otherwise. They can be stubborn and even manipulative with their expressive brown eyes and droopy faces. Training a Black and Tan is not for the soft-hearted. 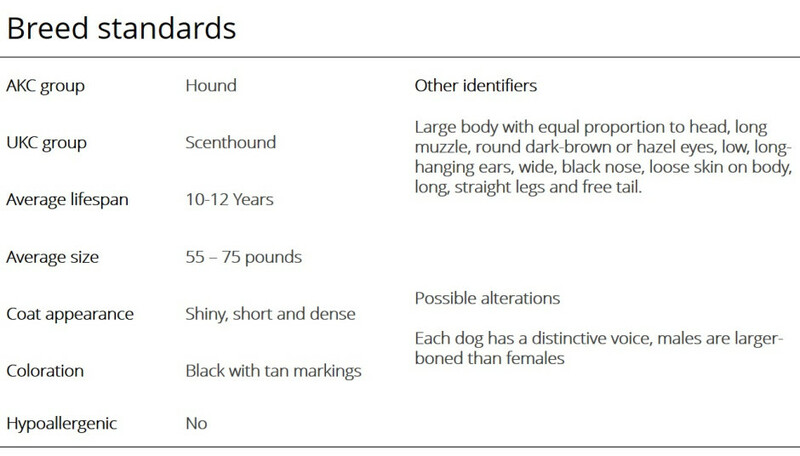 As with most hound breeds, the Black and Tan is sensitive and needs to be trained with a confident, consistent, but gentle hand. Harsh treatment can lead to avoidance behaviors, and extremely sensitive individuals can shut down completely. Positive reinforcement, treats, and a lot of patience will yield the best results when training a Black and Tan. Black and Tans don't need an excessive amount of vigorous activity, and as adults they quite enjoy relaxing on the living room rug or attempting to curl up next to you on the couch, despite their large size. They can adapt to just about any living situation and will do just fine in an apartment. 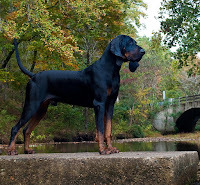 While outside, the Black and Tan Coonhound should be kept on a leash or in a fenced in yard. If they catch a scent, their instincts will take off and employ true hound dog “selective deafness,” and will not obey your commands to return home. They make excellent companions for hunters and farmers. They will track an animal across any terrain, in any weather, and won't stop working until they have that animal penned up a tree. 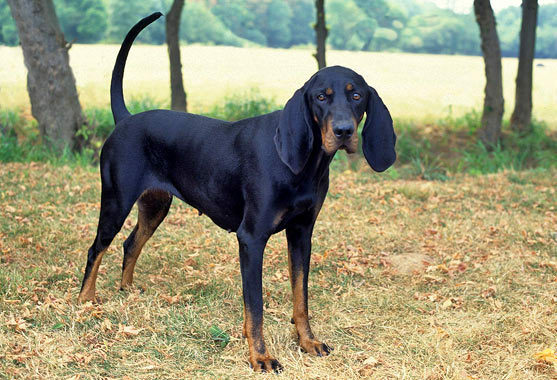 The Black and Tan Coonhound has a short, dense coat. It’s easy to groom, but it sheds a lot. Brush the coat with a hound mitt or rubber curry brush one to three times a week to remove dead hair and distribute skin oils. Regular brushing should keep your Coonhound pretty clean, but if he has a houndy odor you can bathe him to help reduce the smell. Be sure to rinse thoroughly. Shampoo left on the coat can cause dry, flaky skin. Keep those droopy ears clean and dry to prevent bacterial or yeast infections from taking hold. Plenty of Coonhounds like to swim, so dry the ears thoroughly any time they’ve been in the water. Black and Tan Coonhounds are patient and tolerant with children. That said, it's never appropriate to leave dogs and young children alone together. They should always be supervised to prevent any ear biting or tail pulling on the part of either party. Being pack dogs, Black and Tan Coonhounds are always happy to have the company of other dogs. A bored hound will find ways to entertain himself — destructive ways that you won't like — so if no one's home during the day, it's best if he has at least one canine buddy. They can also get along well with cats, rabbits and similar pets if they're raised with them in the home. Be sensible and don't leave them unsupervised with other pets until you're sure they all get along. Due to great exercise needs, this pet will do best with an active family. Playful, loyal and passionate, this gentle giant is dedicated to his owner and his family. A friendly pooch, he'll greet others with ease. Needing good training, this breed will learn appropriate behaviors — without it, he may act out. Best for older children, he may be too aggressive and playful with younger children. In need of a yard and walks, in addition to being a big drooler, apartment life may not be suited for him. Although they’re called Coonhounds, Black and Tans can also hunt other game, including deer, mountain lions and bear. Waking up with a job to do, this pup will be happy to be taken on a walk first thing in the morning. After being fed and engaging in a bit of play, he'll head right back outside to ensure that the home is protected. Satisfied that no stray animals or new humans have come into his territory, he'll go back inside for a pat-down to reward him for a job well done. After an evening run and a swim in the pond, he'll catnap to prepare for tonight's guard watch. If you leave him, he may howl to let everyone know that he's there.